245 Items. Showing Items 161 thru 180. 528042 Fisher Paykel Dishwasher Pump Base. Pump Base assembly for DS603 and DD603 Models. 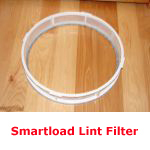 Includes seals and o-ring assembly. This is the stator for the pump rotor and fits in the bottom of the drawer. You may wish to also order item #525884P. NOTE! You must transfer the RPS sensor from your existing base over to the new unit. 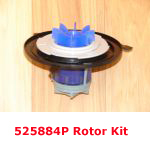 You may wish to order item # 528042B which is a complete pump assembly and includes the base, the rotor, the seals and the RPS sensor. 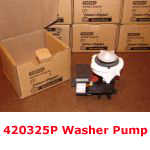 Complete replacement Wash/Drain pump for Fisher Paykel Dishdrawers. Fits DD603 DS603. Includes Pump Base 528042, Motor Rotor 525884P, Base seals and RPS Sensor 526340NP (RPS Sensor part number is now 528602RP.) This is a complete kit to replace the pump assembly on your dishdrawer and is only available here. Upper Lid Actuators for DD603 and DD605 Series Dishdrawers. 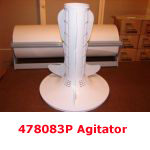 Updated part from original design has moisture protection and more durable motor. Kit includes TWO motors- one left and one right. NOTE: YOUR ORIGINAL MOTORS MAY BE WHITE OR TAN IN APPEARANCE. THESE BLACK UNITS ARE THE DIRECT REPLACEMENT FOR ALL PREVIOUS VERSIONS OF THIS PART. Lower Lid Actuators for DD603 DS603 and DS605 DD605 Series Dishdrawers. These work on single drawer units also. Updated part from original design has moisture protection and more durable motor. Kit includes TWO motors- one left and one right. NOTE: YOUR ORIGINAL MOTORS MAY BE WHITE OR TAN IN APPEARANCE. THESE BLACK UNITS ARE THE DIRECT REPLACEMENT FOR ALL PREVIOUS VERSIONS OF THIS PART. Machine controller for Fisher & Paykel DD603 and DS603 Dishdrawers.NOTE! If your machine appears to have no power, before you order this part, CHECK THE HEATER PLATE! 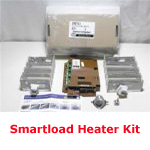 On this model the heater plate acts as a dropping resistor to the power supply, and a failed overload on the heater plate can cause a dead machine condition. This part is often ordered when it is not the source of the trouble. CHECK YOUR UNIT CAREFULLY, THERE ARE NO RETURNS ON ELECTRONIC PARTS! IMPORTANT NOTE- PLEASE READ CAREFULLY! All machine controls are factory reconditioned. This is the only option available for this part. This is as dictated by the factory. This part is not available any longer as a "new" part. Electronic parts are NOT RETURNABLE. All controls carry a 90 day replacement warranty. If you are seeing a broken white strap behind your dishdrawer, this is the part you need! That strap is NOT a hose, it is a guide for the hoses and wire harness. The old white nylon strap system is obsolete and has been replaced by this Link Support kit for dishdrawers. Fits DD603/605 Series models. Retro-fit kit replaces older nylon style on 603 Models. Direct-fit for 605 models. Includes detailed instructions. One kit per drawer. Common cause of F1 code, check to make sure yours is not broken! if you have a double-drawer, you should order TWO of these, as it will only be a matter of time before the other one breaks. Drawer handle trim for DS603SS DD603SS and DS605SSDD605SS series Stainless Steel dishdrawers. This part is plastic and houses the LED display and control buttons on the 603 and 605 series drawers. Replacement flapper valve kit for DD/DS601/602/603 Dish Drawers. Includes two flaps. TECH TIP: This part is often replaced to resolve "cross draining" problems. The issue is not with the flappers, the issue is that your machine probably has a "single" air gap designed for a SINGLE dishwasher. 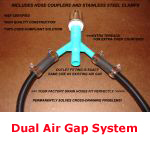 Order our DUAL AIR GAP KIT to resolve cross-drain problems and poor wash problems FOREVER! 528785P Fisher Paykel Dishwasher RPS Hall Sensor. Fits DD605 DS605 and several DD24 series models. 529730 Dual water inlet valve for dishdrawers. Fits DD601 DD602 DD603 DD605 DD24P5 Series Models. Replacement for obsolete 529828 522146. Includes both solenoids and valve body. Genuine Fisher & Paykel Factory Replacement Part. 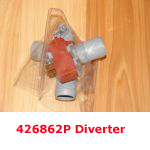 529827 Fisher Paykel Single Dishdrawer Inlet Valve. FOR SINGLE DISHWASHERS ONLY. Fits DS601 DS602 DS603 and DS605 Series. Genuine Fisher & Paykel Factory Replacement Part. 529849P Fisher Paykel Dishwasher Mains Filter Board for Dishdrawer model series DD603 DS603 and DD603I DS603I. This part controls lid motor operation and flood condition (F1) alert. THIS ITEM IS NOT RETURNABLE. Drain connector for double-dishdrawer. Replaces part #525925 which is an obsolete part number. 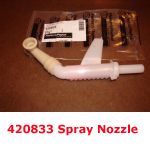 Consider instead of this item, switching to the DUAL AIR GAP Part #WT50. 530317P Fisher Paykel Cooktop Wire Harness and Switch Kit. Includes all ignition switches and wire harness. Fits Models GC901 CG36WAC and GC912. 530550P Fisher Paykel Cooktop Trivet Feet. FITS ONLY MODEL CG36WAC 88253. PLEASE DO NOT ORDER UNLESS YOU HAVE THIS MODEL. THESE ONLY FIT CG36WAC! 12 feet per package. 531606 Fisher Paykel Cooktop Electrode. Fits GC901. Burner Electrode for RR, LR, RF burners. Includes wire and connector.